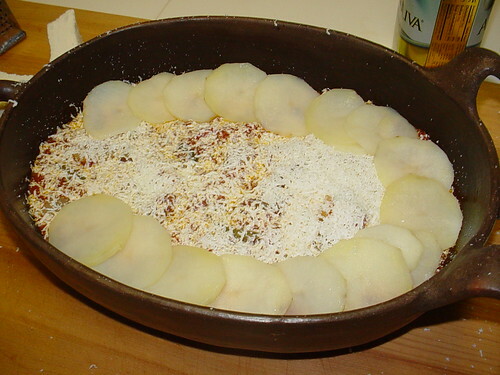 I’d use any excuse to use my Andean clay baking dish (The one with the piggie face and ears), so when I found that I had some green beans on hand and some potatoes that needed using up, a light bulb went off. 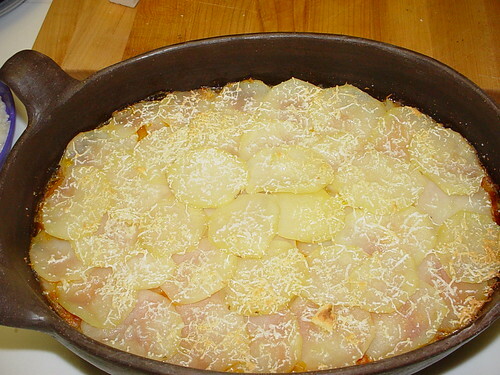 I’ll make an improvised baked casserole/gratin type thing with green beans and potatoes! 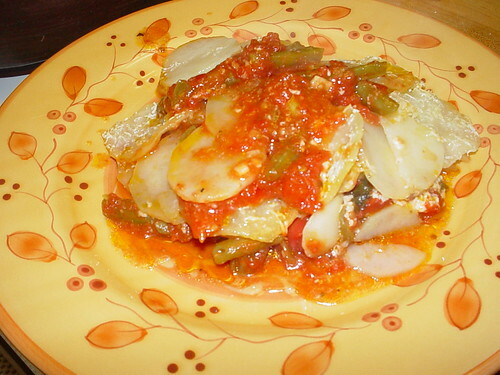 So, I braised the green beans with onions, garlic and canned tomatoes. I peeled and thinly sliced the potatoes on a mandoline. Half of these potatoes went in with the green beans to par cook. The rest were blanched in water and saved till assembly time. Assembly went something like this, plonk the potato/green bean mixture in the oiled baking dish. Top with farmers cheese (I had a lot of that on hand too), olive oil and then layer the blanched potato slices on top in a neat overlapping design. Drizzle with olive oil, more cheese, season with salt and pepper and bake to a golden brown and delicious. Well, that was the idea anyways. While it tasted good and none of it went down the drain, it still was not, as you can see, G, B and D. I think using the whole can of tomatoes was not a good idea, so the ‘filling’ was much wetter than it should’ve been and it prevented the top layer of potatoes from browning. The flavor needed some boosting as well, so I topped my portion with some chilli flakes.